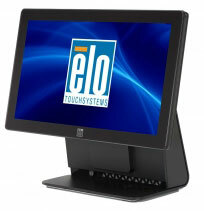 The E-Series touchcomputer is an elegant, retail-hardened touch solution with a small footprint, developed to fit into hospitality and retail environments. The compact, ruggedized touchcomputer delivers a 15-inch touchscreen, Intel Celeron dual-core processor, 2GB RAM and 320GB storage. Designed to fit on top of a cash drawer, it can also be wall-or pole-mounted depending on the installation needs. The Elo E023735 is also known as Elo Touch Systems	ELO-E023735	.